It is lunar year 1001, and Entropia City is ravaged by an inexplicable kitchen fire. In the ensuing chaos, the Childish Robot Czar and his Animatronic Shock Troops seize power and oust the royal family for nearly a decade." This is the story of Queen Pingo the Young and her unwavering pursuit to end occupation and bring justice to all sentient beings. This is also the testimony of a country named Entropia, with its traditions, inhabitants, and historic milestones masterfully documented through a collection of unusually rare stamps. 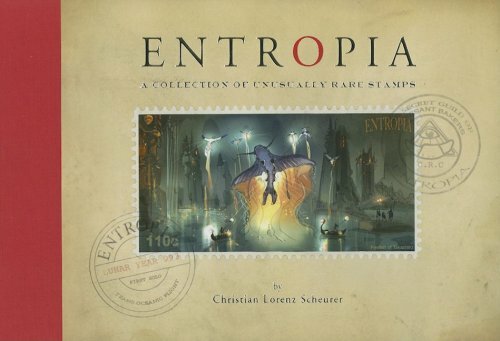 The book tells the story of planet Entropia through stamps. It's like those limited edition collectible stamp books published by post offices from time to time, except the stamps here are larger and unusable (unless you're on Entropia). The 128-page book is slightly larger than a DVD case but presented horizontally. Inside are 60 stamps created with ink and watercolour. That's one stamp per page printed on a black background, with the accompanying text on the page beside. It's written like a travel guide or postcard, touching on topics like famous produce in areas, the culture of inhabitants, historical events, failed government experiments (e.g. float cities with balloons), snapshots of life and other very interesting stories. The art is beautiful, but it's the stories that really give the book depth. It's positively creative and enjoyable to read. Highly recommended. Christian Lorenz Scheurer was born in Bern, Switzerland. As the son of a zoologist father and an artist mother, he lived in many countries throughout his childhood, from the bush in South Africa to the Seychelle Islands. After winning the prestigious Philip Morris Award for his graphic novels and working on movies and award-winning commercials in Europe, Scheurer was struck by lightning. He then decided to pursue a career in Hollywood as a concept artist. During his U.S. career, Scheurer has worked on some of the most innovative movies, games, and commercials in the entertainment industry as a conceptual designer, matte painter, and art director.